Hillcrest Mall wanted to send invitations that were sure to catch their guests eyes and encourage press and influencers to attend the exclusive hard hat tour of the new Wing at Hillcrest Mall. 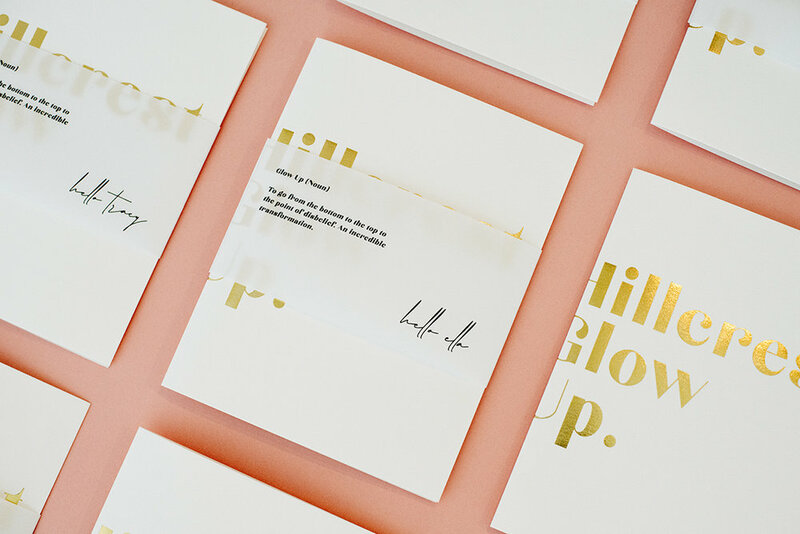 The front invitation holder features their brand new Hashtag #HillcrestGlowUp in gold foil which is slightly obscured by a frosted vellum. The vellum reads the definition of “Glow Up” and each vellum band is customized to greet each specific Invitee. Inside, the invitation is found along with a custom illustration of each guest invited creating a one-of-a-kind piece they’ll want to keep. Each vellum band was hand sealed closed with the monogrom “H”, matching the gold foil to create a luxurious and one of a kind invitation.